Since today is Wednesday, I am sharing what is on my work desk with you! Today I received my prize in the mail for being one of the lucky winners of the August Tag Challenge of the 12 Tags of 2014 on Tim Holtz's blog. I found out I was one of the winners on Labor Day, which was such a fun surprise. Here are the goodies that I was sent. I am very excited about the stamp set, as I had my eye on it! I can't wait to spend some time creating and using these fun goodies! Thank you, Julia , for the desk hopping fun! I look forward to seeing what you are up to this week! Great goodies one can never have enough TH stuff. Have a lovely week. Well done, Winnie. Great prize for you to get stickier, inkier, fingers. Well done you for winning! 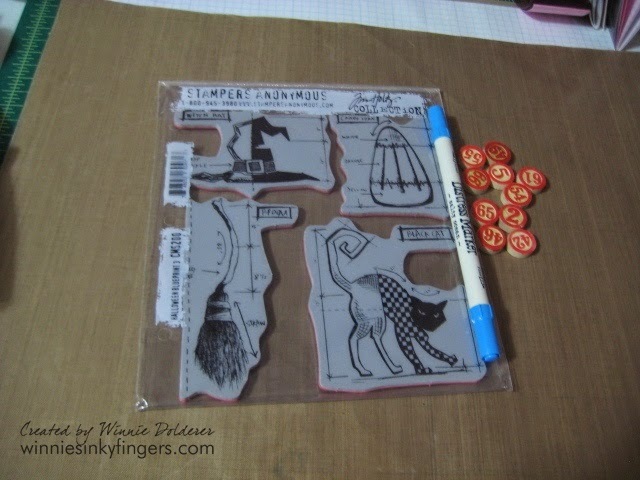 I can't wait to see what you do with your new stamp set. Thank you for stopping by and leaving a comment. Have a great week! Lucky you! That stamp set is fab! Congrats on the win. Looks like a fun stamp set to play with. Can't wait to see what you create. It is National Coffee Day!